THE PORT OF CHARLESTON REPORTED ITS STRONGEST JULY ON RECORD FOR CONTAINERS: The 100,366 boxes handled at the Wando Welch and North Charleston terminals broke a July record set in 2005. SCPA's TEUs for FY2016 increased of 1.4 percent. SCPA: Modest container volume growth in a tepid world economy. SCPA: growth through automotive and specialized cargo. The South Carolina Ports Authority reported last week 2016 fiscal year-end operating earnings of $39 million, revenues of $211 million and operating expenses of $172 million. 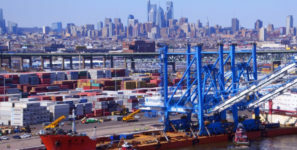 “The port closed the FY2016 books with solid financials, reflecting our commitment to achieving the necessary performance to support our aggressive capital investment plan,” said SCPA Board Chairman Pat McKinney. “With modest container volume growth in spite of a tepid world economy and operating earnings up over last year, SCPA is well-positioned to continue moving forward with key strategic projects and above-market growth,” said SCPA president and CEO Jim Newsome. SCPA’s 2017 fiscal year began in July with a TEU volume increase of 1.2 percent above the same month last year. The port handled 177,265 TEUs in July, compared to 175,223 in July 2015. The port reported its strongest July on record for pier container volume. SCPA handled 100,366 boxes at the Wando Welch and North Charleston terminals, exceeding the previous July record of 99,972 pier containers set in 2005. SCPA’s non-containerized cargo volumes in Charleston exceeded fiscal year plans last month by nine percent. Charleston handled 70,773 pier tons of breakbulk cargo in July. Inland Port Greer handled 7,303 rail moves last month. With 56,875 rail moves calendar year to date, the facility’s volumes remain on track to reach 100,000 moves in 2016.